While some may just see a doll as just a plaything, some parents see them as another way to learn. 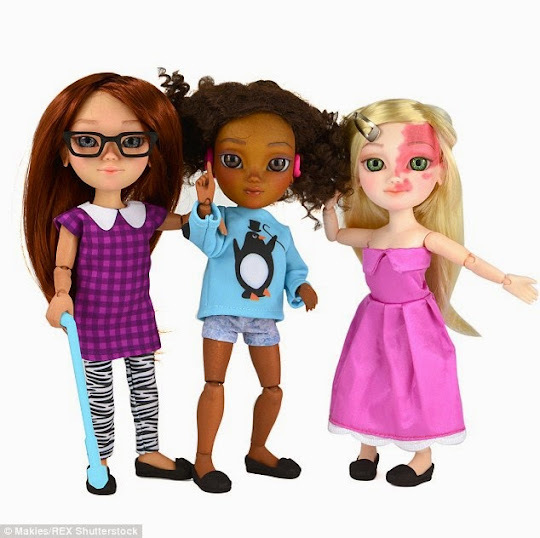 Now British toy manufacturer Makies has launched a range of 3D-printed dolls with visible disabilities in an attempt to improve diversity in children's toy boxes. The little models come in response to online campaigns like Toy Like Me which criticise the limited representations of adults available for young children. The range of three dolls, which are also diverse in race and appearance, are in direct opposite to the artificial mannequin shape of a Barbie doll. Each one comes complete with different characteristics such as birthmarks and scars and one of the dolls is visually impaired, with a walking stick and glasses. Another wears two hearing aids and makes the 'I love you' sign in American sign language. The developer, Makies, used 3D printers to create the dolls, just days after Facebook group and community, Toy Like Me, reached an audience of 50,000 with their posts of toy 'makeovers' by parents of disabled children. The 'makeovers' saw toys being given additional features such as hearing aids, stomach tubes and small guide dogs, as parents rallied for toy brands to be more inclusive of children with disabilities. The custom-designed Makies range are the world's first 3D-printed doll and retail at £69. The company have also revealed that they are currently working on a wheelchair version soon, and planning on trialling bespoke face characteristics on the dolls. This way, parents would be able to create a toy with exactly the same birthmarks or scars as their child.